Looking for a Mentalist? - CLICK HERE FOR THE MENTALIZER NEW WEBSITE! You arrived to the right place. The Mentalist Ehud Segev (aka The Mentalizer) is a world renowned super mentalist who performed his shows in theaters and on TV around the world. He is currently performing his mentalist show in corporate events and parties all over the world. Ehud the mentalist is well known from the international mentalism hit-TV-show "The Successor" that broke all records of ratings in Israel and around the world. 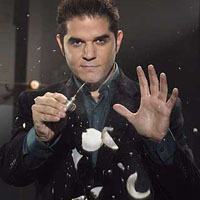 He was later featured in the primetime NBC hit "Phenomenon" with Criss Angel and Uri Geller. Segev performed on channels all over the world including NBC, CBS, FOX, The History Channel, NDTV (India), STAR, Channel 2 (Israel) and more! Ehud has premiere his off-Broadway mentalism production "ANOMAL - STORY OF A SUPERNATURAL BOY" in the American Theater of Actors in Time Square and received critical acclaim. He then toured the world performing elements from the show all around North America (including Canada and Mexico), Europe, the Middle East and far-far-away in place like India and Sarajevo. If you're looking for a wonderful mentalist for your next party or corporate event, look no further. You arrived to the best mentalist in the field! 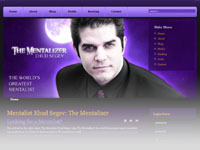 CLICK HERE TO VISIT THE MENTALIZER'S NEW WEBSITE AND SEE THE NEW TRAILER!